The FRLAEF is offering six Regional Workshops this fall. ProStart teachers may bring up to five students to each event. There is no fee to attend a Regional Workshop. Lunch will be provided for all attendees at each event. Chef coats will be given to all participating ProStart students at each event. Travel to and from events is on your own. If Regional Workshops reach maximum capacity prior to the deadline, all subsequent schools will be placed on the waiting list. Most events begin at 8:30 am and conclude no later than 2:00 pm. Please do not register for more than one event. We only have space for first-time attendees at each event, so register for the event you are most interested in attending. If you are interested in another event, let us know and we will send you the link for the Waiting List. CLICK HERE for the Regional Workshop page with details and registrations links for each event. The recipient of the $2,000 Garrett M Hughes scholarship is Chyanna Hernandez from the ProStart program at South Tech Academy in Boynton Beach. Ms. Hernandez had a 3.5 GPA while in high school. She worked at Panera Bread while also competing in Skills USA and volunteering at culinary events such as open house and staff luncheons. She has her ServSafe certification and also earned her ProStart Certificate of Achievement. According to her ProStart instruct, Suzanne O’Neil “Chyanna has always displayed a high degree of integrity, responsibility and ambition. She is definitely a leader rather than a follower. In addition to her excellence scholastic accomplishments she has proven her leadership ability in the culinary class here at South Tech.” Ms. Hernandez started Johnson & Wales University this fall. The FRLAEF Board of Trustees will review all Premier ProStart school applications for the Extreme ProStart Kitchen Makeover during the FRL Show this week. Applicants will be notified of their status no later Friday, September 21, 2018. The FRLAEF received over $123,000 in Mini Grant requests from Florida ProStart and HTMP Schools. The FRLAEF Board of Trustees is meeting this week during the FRL Show to determine the award amounts. Applicants may expect to receive their award email no later than Friday, September 21, 2018. Once funds are awarded, recipients will have until November 30, 2018 to spend their grant money. The 19th Annual ProStart Culinary Team Competitions will take place Friday, March 1 — Saturday, March 2, 2019 at the Rosen Plaza Hotel in Orlando. On Friday, March 1, half of the Culinary Teams and Management Teams will compete along with all Edible Centerpiece teams. On Saturday, March 2, the remaining Culinary and Management teams will compete along with all of the Waiter Relay Teams. The competition will be followed by an awards dinner on March 2, 2019 at the Rosen Plaza Hotel. STIPEND FOR COMPETING SCHOOLS The FRLAEF will provide stipends to offset the cost of participating in the event. The stipend amount will be announced when the number of competing teams is finalized. RULES Competition rules are now available on our competition web page HERE. HOTEL The Rosen Plaza Hotel will be the host site for the 2019 ProStart Culinary Team Competitions. The room rate at the Rosen Plaza is $129 per night. To reserve hotel rooms, use THIS LINK or contact the Rosen Plaza at 800-627-8258 and reference the FRLAEF ProStart Competition Salute to Excellence. The deadline to make hotel reservations is Wednesday, February 13, 2019. But don’t wait this long to book your rooms! These rooms sell out quickly. Go ahead and reserve your hotel rooms. You can always cancel before the deadline if you decide you want to stay elsewhere. PARTICIPATION CLICK HERE for the competition application. The application deadline is Friday, October 12, 2018. Applicants will be notified their status by Friday, October 19, 2018. Marriott is interested in connecting to more ProStart students and schools in Florida. If you are currently working with a Marriott, please let us know! We would like the property name and contact name to share with them. Marriott is hiring all positions for St. Regis Bahia Beach Puerto Rico. This property is opening in November 2018. If you have former students who may be interested, please pass this information on to them. CLICK HERE for the Management Positions flyer. CLICK HERE for the Non-Management Positions flyer. Forest High School in Marion County is in need of a culinary teacher. For more information CLICK HERE and then look for the Careers tab at the top right corner to apply. The Hospitality Industry Internship (HII) provides the opportunity for Florida ProStart & HTMP instructors to work in a foodservice/lodging establishment for at least 40 hours. Once the required paperwork has been processed, the participant will receive a personal check for $600 from the FRLAEF. To qualify for an HII, the instructor must teach the ProStart/HTMP curriculum during the 2018-2019 school year. If you are already employed at a restaurant or hotel, you MAY NOT use that site for your internship. The restaurant/hotel must also be a new work experience for you, not somewhere you have worked before or used as an HII internship location. The National Restaurant Association Educational Foundation (NRAEF) will continue its ProStart Data Collection this year. The survey is managed by Westat. The FRLAEF will let you know when the survey is expected to arrive. The email will contain a password unique to your program. Once you complete the survey, the FRLAEF will send you an email where you can request $350 worth of free foodsafety materials. These are on a first-come, first served basis, so complete your NRAEF survey as soon as possible. The Salute to Excellence Awards will take place on Saturday, March 2, 2019 at the Rosen Plaza Hotel in Orlando. The awards dinner will recognize all ProStart Competition, Pineapple Award, Scholarship recipients and Hospitality Excellence Awardees. Registration will begin in January 2019. ProStart instructors will have the opportunity to recognize one student during the awards dinner with a Hospitality Excellence Award. These students will be called on stage during the awards dinner and recognized with a certificate. All ProStart instructors may receive a complimentary ticket to the awards dinner. Hospitality Excellence Award students receive two complimentary tickets, one for them and one for a guest. Each Premier and Full ProStart program is eligible for free ServSafe or SafeStaff materials. To ensure you get the materials you need, you must notify us of your needs. Once we receive your ProStart Classification paperwork, you can order up to $350 of ServSafe/SafeStaff materials. Click here for the price list. Email Amy Parker to place your order–you do not need to fill out the form. Requests are filled on a first-come, first-served basis. NRAEF has finally made the 7th edition Instructor tools available! The Instructor USB is $200 if you are interested. It is listed on the price sheet. The FRLAEF will distribute over $25,000 worth of free ProStart Exam Scantrons to Premier and Full ProStart schools during the 2018-2019 school year. Once a school has turned in their ProStart Classification paperwork, email Amy Parker to let her know how many ProStart Exam Scantrons you need. Requests are filled on a first-come, first-served basis. The FRLAEF will award $44,000 in scholarships during the 2018-2019 school year. These scholarships will be awarded during the Salute to Excellence Awards in the Spring. The scholarship application will be available in late Fall. 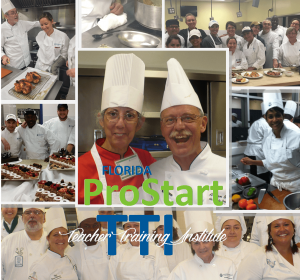 The 23rd Annual ProStart Teacher Training Institute will take place in June 16-21, 2019. The week-long training provides Florida ProStart instructors with the knowledge necessary to teach the ProStart curriculum. Each day’s learning is built around topics covered in the ProStart curriculum. All classes will be held at Johnson & Wales University (JWU) North Miami campus, 1701 NE 127th Street, North Miami, Florida, 33181. The FRLAEF will cover the cost of all Florida ProStart instructors who will be teaching the ProStart curriculum during the 2019-2020 school year. Attendees will be responsible for their travel and some meals. Online registration will begin Spring 2019.